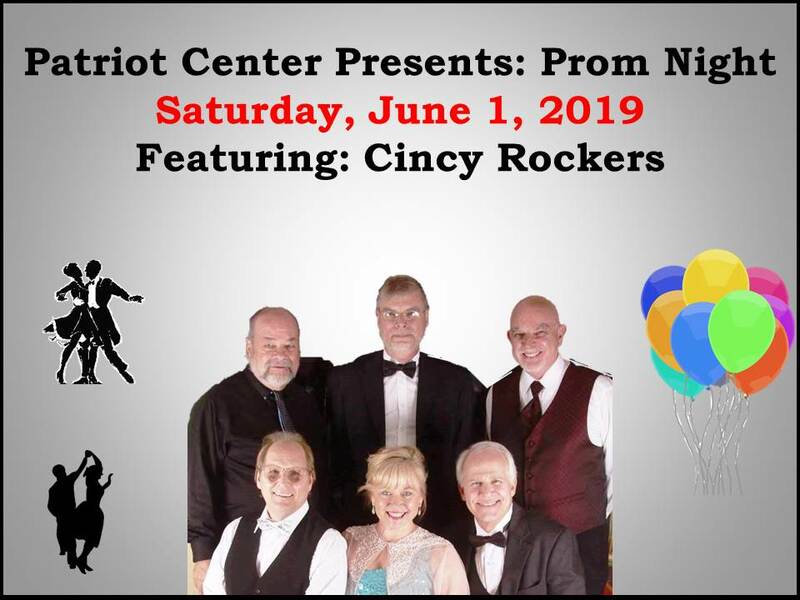 The Cincy Rockers will host the second Patriot Center "Prom Night". This is one of Cincinnati's premier bands, playing the music you want to hear. Beautiful newer facility in Anderson Township with ample parking. Excellent dance floor with capacity for a large crowd. Tickets: $10 online or by phone at Showclix Box Office. Tickets purchased at the door are $12.50, if available. Ticket price includes all fees and taxes. Cash Bar for beer, wine, mixed drinks and soft drinks. The Patriot Center is a Permit Premise, outside beverages are not allowed. No BYOB. Table snacks (pretzels and chips) will be provided. Light snack foods and appetizers may be brought in. Groups of six or more ordering together will be pre-assigned to tables together. All others are open seating.